In the olden days, crowns were only possible in one material, metal. While metal is a functional repair, there is no getting away from the fact that metal teeth are simply not attractive. Not to mention, some patients have allergies to metal, which can cause painful irritations. 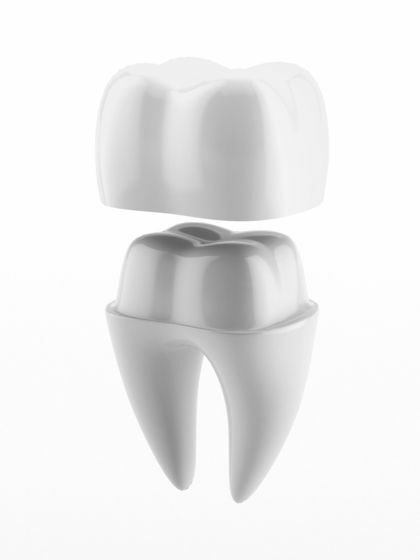 Now, there are two main types of crowns, ceramic crowns and porcelain crowns. However, ceramic crowns are not as durable as porcelain crowns. On the other hand, porcelain crowns offer all the benefit of a crown without compromising on aesthetics. During your consultation, we will ask for information on your general health and wellbeing, as well as taking into account your dental history. If you have any dental anxieties, they will also be addressed during this consultation. A thorough examination of your teeth and mouth will be undertaken, so that we can determine the extent of the work that needs to be carried out. We will also request that x-rays are taken. All of these steps will help us build a clear picture of your oral health. You have a large cavity in a tooth. You already have a larger filling in the tooth. You need to replace an older crown that is damage. You need to replace an older crown where the tooth has decayed. If you have a weak tooth that is at risk of breaking. If your tooth is an unusual shape. If you have a tooth that requires a larger filling than is possible. If you have a discolored tooth. The tooth is too damaged to support a crown. In this instance, we may recommend dental implants instead. If the patient grinds their teeth in their sleep, as this will erode the crown very quickly. In this scenario, a porcelain crown may be an option if the patient is committed to wearing a mouth guard while they sleep. Are you ready to make the next step in restoring your smile with porcelain crowns? At Vero Dental Spa, we will be happy to advise you and help you get started on the journey to healthy, beautiful teeth. If you would like to discuss your candidacy for porcelain crowns, or if you would like more information, call Vero Dental Spa today at 772-778-5550.